Ginger High- Books R Us: ENTER THE MAS MOTHERS DAY SWEEPSTAKES AND YOU COULD WIN $1000. ENTER THE MAS MOTHERS DAY SWEEPSTAKES AND YOU COULD WIN $1000. Mother's Day is this weekend. 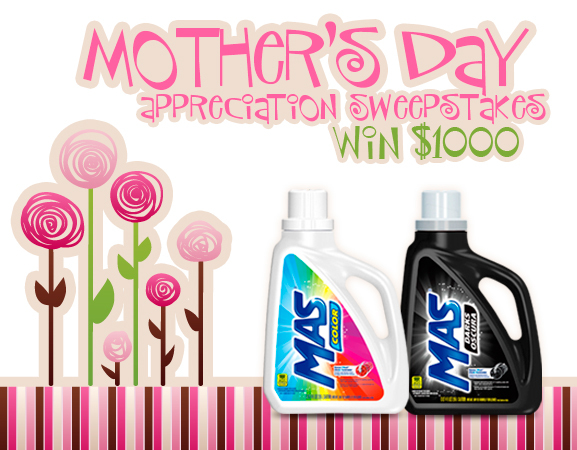 So enter the Mas Mother's Day Sweepstakes and you could win $1000. I know laundry is a chore and us Moms are not always appreciated for all we do but we know that we are doing the right thing for our family.What is a Mother's Love? Mas is the number one detergent in Mexico and is being sold for the first time in the US by Walmart. Your clothes reflect who you are as a person, so don’t let faded darks or washed out brights ruin your first impression. Instead, use MAS detergent, which helps to protect and renew your colors and darks thanks to its unique Renew Effect. Mas Color- it contains active ingredients that renews your colors and makes them look fresh and bright. Mas Oscura- Perfect for your dark clothes and prevents them from fading. Would you like to win a $1.00 coupon for your self so you can try the detergent for yourself? The coupons are only good in Walmart and are written in Spanish.